Check out SeatGeek for all your concert ticket needs! Click here to read SeatGeek’s blog about the road to Camp Bisco X! Big shout out to Sebastien Barre for many of the photos in this post. Last weekend, the 10th installment of the Disco Biscuit’s music festival, Camp Bisco, took place in Mariaville, NY. This year’s event was significantly larger than all previous year’s, with attendance up nearly 75% from last year’s event, which took place last July. 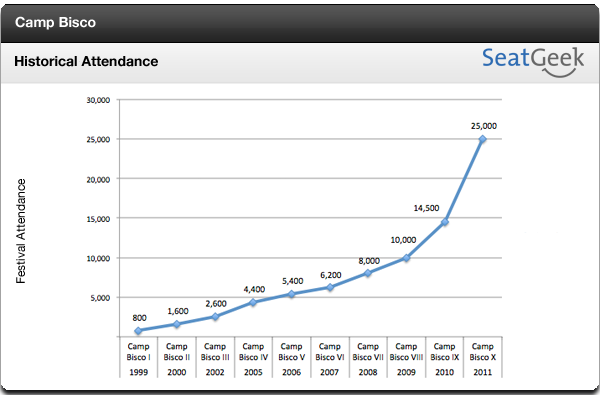 Check out the graph below to see how Camp Bisco has grown over the years, since its first appearance in 1999. Although this was the largest Camp Bisco to date, fun and good times were still had by all. There were countless highlights and standout acts throughout the whole weekend. No matter if you were there for the Disco Biscuits, the dubstep, or even just the party and atmosphere, Camp Bisco was truly an amazing experience. If you weren’t able to attend Camp Bisco X, or if you simply want to relive some memories, check out SeatGeek’s Camp Bisco 2011 Recap, complete with Camp Bisco setlists, pictures, and videos from the weekend. Be sure to come back soon, because SeatGeek will continue to update this blog with more setlists, photos and videos as they are released and uploaded. See you all at Camp Bisco XI in 2012! Continue reading for more Camp Bisco X pictures, setlists, and videos! * = sebastien.b via flickr – Click here to see the rest of Sebastien Barre‘s Camp Bisco X photos. Stay Tuned for more Camp Bisco setlists, pictures, and videos as they are released and uploaded! Click here for Disco Biscuit’s concert tickets!